Exploring the power of symbols and themes to create and transform our lives. April Fool’s Day is a day to play jokes, which can (if we’re lucky) have the positive effect of shaking people out of their stupor, and hopefully making them laugh. This is great for seeing things from a new perspective and lightening up – or maybe even Enlightening Up! Caroline Myss examines the archetype of the Fool along with about 70 others, in her book Sacred Contracts. She explains that the fool is more than a simpleton, but by acting like one, he is able to communicate serious issues through humor. The shadow, or negative aspect, of the Fool archetype manifests as cruel personal mockery or betrayal, specifically the breaking of confidences gained through knowledge from the inner circle. • the Sufi (mystics of Islam) figure Mullah Nasruddin, popular in Egypt, Iran, and Turkey– half saint and half fool, he acts like a ninny to teach wisdom. • Or of King Arthur’s court jester, Sir Dagonet, who was knighted as a joke, but who also performed bravely in tournaments. So don’t be afraid to act like a fool on April Fool’s Day. It may offer the breakthrough you’ve been looking for! Written by Malayna Dawn for her blog, Symbolic Themes. Coyote Medicine Card from Animal Medicine Cards by Jamie Sams, David Carson and Angele Werneke. 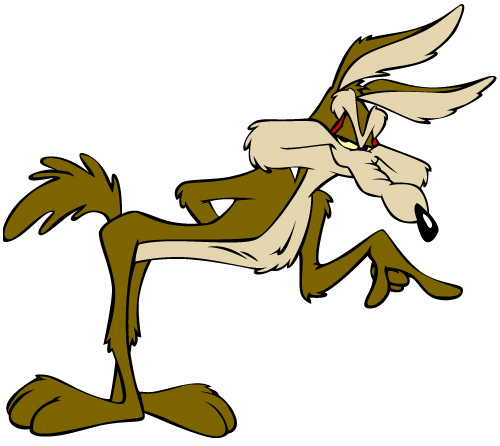 Wile E. Coyote image from Digital Citizen. Visit the blog at PopConscious.com and find links to listen to any of the over 100 episodes that connect entertainment to enlightment. Learn how to travel the world, and/or through time and upon flights of fancy! Visit the Spiral Whirled Travels website.